Exposed concrete floors are durable, hard wearing and useful for all sorts of applications from warehouses to art galleries and garages to domestic living rooms. They are particularly useful for heavy loads or traffic or, when combined with underfloor heating, for continuous and efficient space heating. As a finish they can appear utilitarian or luxurious depending very much upon the chosen materials and installation techniques. Technically, the upper face of a concrete floor is called an “unformed” face, in contrast to “formed” concrete faces which obtain their shape and texture from the moulds or formwork in which they are cast. Unformed faces are typically flat and require post-finishing techniques to achieve the required texture. The most prevalent texture or finish for internal exposed concrete floors is polished – either power-trowelled for a smooth solid appearance, or diamond-ground to expose the aggregates. A requirement for greater slip resistance is often a driver to explore other options, such as the inclusion of retardants or shot-blasting. Some of the techniques more commonly used for external surfaces, such as imprinting or brushing, can also be used to good aesthetic effect inside. “Wearing screeds” (formerly known as “high strength concrete toppings”) are usually installed once the space is enclosed, unlike a structural floor slab. They are specifically designed to serve as a floor finish, often incorporating pipes for underfloor heating, and require care and expertise to execute correctly. Designers are advised to seek guidance from specialist installers at early stages of design development when specifying screeded floors. There are two ways to create a smooth, polished patina to concrete floors, but each achieves quite a different visual appearance. This technique creates a smooth finish, with varying degrees of shine and exposed cross sections of aggregate. The top millimetres of the concrete are mechanically ground away to expose the aggregate, often using diamond grinders. The surface is then polished with increasingly fine-grade buffers to achieve the desired finish. It can take on the appearance of terrazzo depending upon the colour of cement, pigments and type of aggregates used – specialist suppliers and installers offer a huge range of colours and aggregate combinations. The depth of grind will determine the degree of aggregate exposure, ie larger aggregate sections will be revealed with a deeper grind. More commonplace mixes of in-situ concrete can also be finished in this way. This is often a technique used to level and finish existing floors, although the final result is unlikely to be as consistent as where a floor is designed and placed to be polished in the first place. Unlike the mechanically abraded system, this technique takes place before newly placed concrete is fully cured and timing is critical to achieve a successful finish. The surface is floated, often using a pan floater, and then trowelled progressively to produce a natural polished sheen. This is most commonly achieved using power tools but it is also feasible to trowel small spaces by hand. Further degrees of polish can then be obtained by using different surface sealants if required. The resulting floor has a more solid colour, sometimes described as mottled, or a natural patina but with minimal visible aggregate. The colour of the floor is determined primarily by the fine content of the concrete mix, ie the cement, sand fines and any pigments in the mix. Alternatively, this technique can be used to install a pigmented dry-shake finish, creating the desired colour on the top surface of the concrete. Exposing the aggregate in concrete can also create grain, texture and pattern in floor surfaces, which is particularly useful for areas requiring greater slip resistance, especially when wet. The uppermost layer of concrete, or surface mortar, can be removed in a number of ways, each with subtly different results. A key consideration is the practicality of application and the degree of control required for the specific project. Appropriate specification of the concrete mix is essential for a high-quality exposed aggregate finish, since “normal” concrete is unlikely to contain sufficient aggregate at the surface once compacted. A range of proprietary mixes are available with different combinations of coloured aggregates and binder. Common techniques include: exposure by washing or brushing, the use of surface retardants or abrasive or shot blasting. Washing or brushing away the surface mortar of the concrete is in principle the simplest method of exposing aggregate in newly poured concrete. However, skilled execution and timing are critical to ensuring that the concrete is sufficiently stiff to hold the coarse aggregate in place while the surface is sprayed or brushed, but not too hard so that it is difficult to remove the surface layer. Surface retardants offer a more controlled method of exposing the aggregate. Liquid surface retardant is sprayed onto the surface of the wet concrete, preventing the uppermost layer (known as mortar) from setting and allowing it to be washed or brushed away. The depth of mortar removed, and therefore amount of aggregate revealed, is determined by the choice of retardant. Texture patterns can be created in the floor surface by using stencils to mask areas of the concrete before the retardant is applied. The protected areas remain smooth alongside the more grainy texture that is left where the aggregate is exposed. The effect is intensified when the pigment and/or cement colour contrasts with the sands and aggregates. As with all techniques, timing and skill is important for effective execution. is a simple technique for mechanically removing the top layer of hard concrete to create a stippled surface, often used to improve adhesion for supplementary finishing layers. If intended to be a final finish, careful control is required to ensure consistency. A test patch is recommended so that the degree of shot blast can be agreed. As with depth of polish, the heavier the abrasion, the larger the pieces of aggregate that will appear. There are many fine examples of patterns created using stencils with this technique. is a common technique for creating texture in external concrete and can be a cost-effective way of improving slip resistance. A tamping beam is progressively lowered and raised along the face of the floor to imprint freshly placed and levelled concrete. This creates a surface with ridges, with their frequency and width depending on the size of the beam. It can be specified as light, medium or heavy tamp but these descriptions are not clearly defined and a benchmark or test panel is advised. Is similarly cost-effective finish for adding slip resistance and is useful for utilitarian areas where aesthetics are less important, due to the difficulty of obtaining a uniform finish. It does offer opportunities for pattern and variety depending on the direction of drag and the material used. Stiff bristled brooms give a coarser texture than those with soft bristles, for example. While actual sweeping brooms can be used, a purpose-made brush with steel bristles or tines is more appropriate for commercial applications. Other dragged surface finishes include ‘Turf drag’, ‘Hessian drag’ or ‘tine finish’ using different materials to create the texture as their name suggests. An alternative method for adding texture to wet concrete is stamped or pattern imprinting using mats or rollers. Most commonly used externally, standard systems are most likely to be in the form of patterns with stone, cobbles or herringbone for paths and patios, but the technique offers opportunities for unique textures and patterns through the creation of bespoke mats. 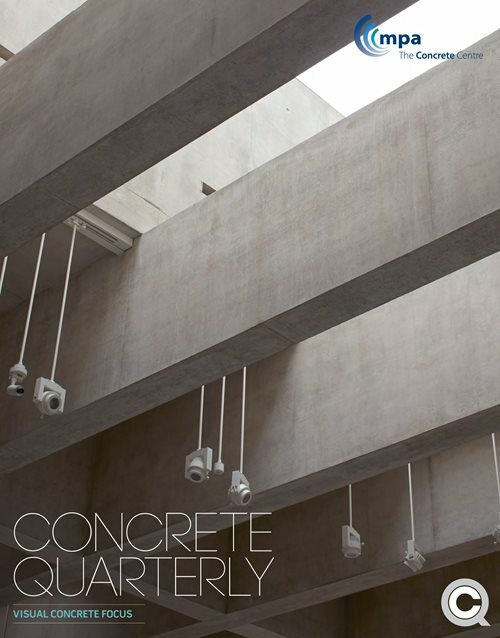 The use of tamped, brushed and imprinted concrete on internal spaces may be restricted by the ability to gain access to create the finish in the wet concrete. This therefore requires consideration of sequencing early on. The colour of a concrete floor will be determined by the through colour of the mix, which will itself vary in appearance depending on the surface texture employed and how much of the aggregate is exposed. It is also possible to add different and permanent colour to the upper surface only of the concrete. Dry shake toppings are powder or granules broadcast onto the surface of the concrete before trowelling. Once trowelled into the floor, this results in a hard, durable surface. There is a wide range of coloured pigments available, including grey, and toppings can be selected to suit the specific performance requirements of the floor. Many include a surface hardener to improve the durability of the floor finish, but they can also provide abrasion resistance and are often used to improve the surface finish of large pours when steel fibres are included. Colour stains can be applied to either trowelled or diamond-ground polished floors and offer the advantage of colour variety and a controlled application to create pattern, allowing the natural tonal variation of the concrete surface to show through.